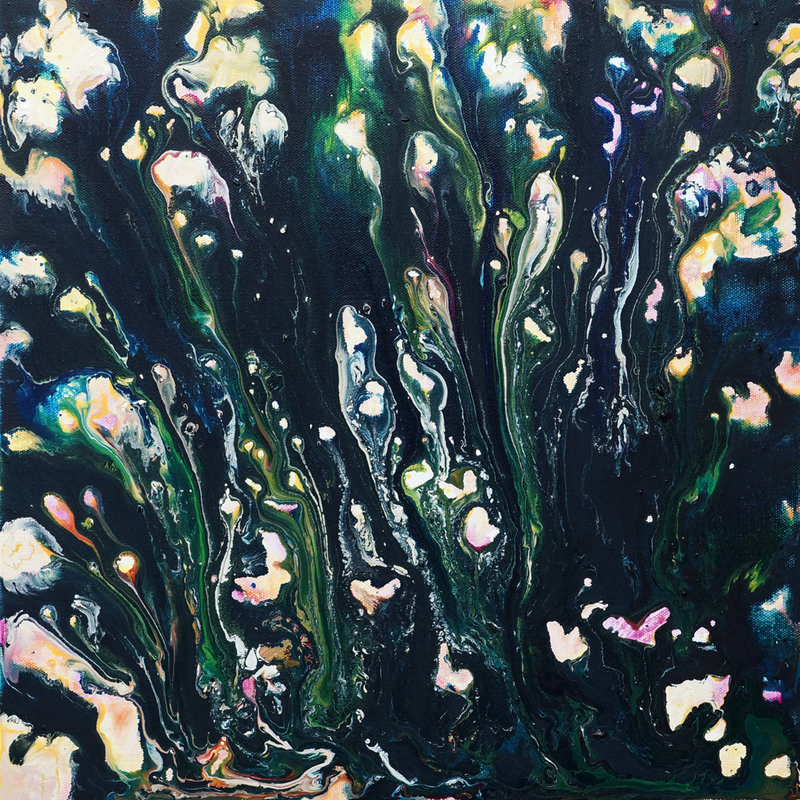 Japanese artist Nakajima Mugi’s works open into a world of intense color and detail, and are filled with nuances and interactive play around the hues of the natural world. The artist often thinks and displays his works in pairs, as a group of three, or even in large groups on the wall. Putting the art pieces together changes the atmosphere of the space. What attracts me in his style is probably the technique of letting the color drop on canvas while in the process, which results in a possibility of chance, or accident. Yet the control of the colors and their order in the palette is made by the artist who masters the materiality of his vision. A series of paintings ‘blue on blue’ represents chaosmos paintings which are abstract (chaosmos: chaos and cosmos). The vivid colors of acrylics show off the surfaces of plastered paint. The ‘cosmos’ means order where accumulation of drawings create an entire landscape. The outcome comes close to patterned design textiles that expose bold attitude. Japanese and Finnish design and art worlds have something very similar in their approach, whether they meet in minimalism paying attention to detail and form, or stand for an oasis of calm. The interpretation of nature is present. The artist uses different techniques to enhance his vision. ‘Blue on blue’ series includes two types of paintings of different techniques and textures. In one the fluid colors run on canvas as mentioned above. The other is a quiet one-color painting. 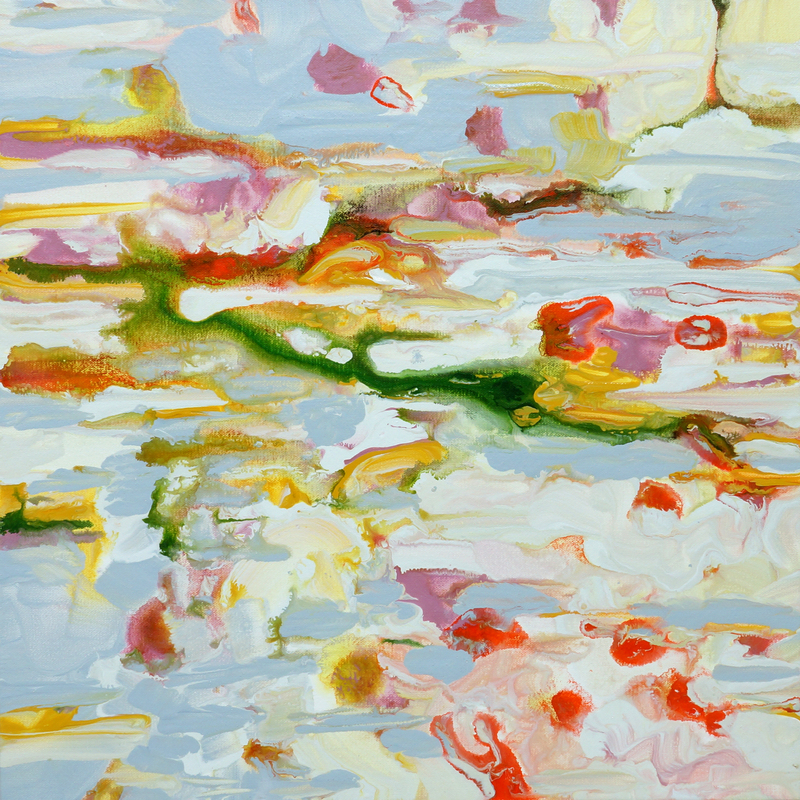 Nakajima Mugi’s color-drop style recalls art informel and abstract expressionism. Solid color, then, reminds of Hard-edge paintings (Ellsworth Kelly) or Color field paintings (Barnett Newman). When Mugi’s works are arranged side by side the combinations do not follow strict rules but form an installation. The cosmos is ever-changing its rhythm, and the works show seasons and time. ‘Blue on blue’ changes according to exhibit space aiming to demonstrate the polyphonic of the paintings. Nakajima Mugi was represented at the New City Art Fair in Chelsea, New York City in March of 2014 with the Gallery OUT of PLACE which is located in Nara and Tokyo. The gallery presented variations from his ‘blue on blue’ series. It also showed his other works that communicate well with urban and architectural environments. The artist has created installations with spatial variation including traditional Japanese houses as well as urban window-displays which communicate both inside and outside.